Designer Clothes for Less and Why I Said "No"
At some time or another, my fellow Frugal Fashionistas can probably relate to one of my biggest clothing struggles. It surrounds learning to say “no” to great deals. When the price is right, and the outfit is “kind of” right, I buy it. I mean, why not get it when it’s only $3 – $5, right? Well, often that has been my mantra, but even on my worst math days I understand that $5 plus $5 plus $5+ adds up to groceries for the week. Do you all remember this amazing red, wool trench coat I purchased? It’s in my Core Wardrobe Pieces – the Trench Coat post? Well, even though I only paid $5 for it, it’s not a great deal if I never wear it, and I haven’t. I never got it altered, so it was a waste of $5. I’ve been staying out of the Goodwill lately until I de-clutter a bit more, but decided to pop in this past week. I left empty handed (gasp). Here are a few of the great fashion deals that I passed up. Every single item I liked, but for the following reasons I passed on them. I’ve shared before how important it is to know your best color season. Finding your right colors makes all the difference when choosing new clothes. As much as the above green shirt and off white shawl were stylish and fit well, the colors washed me out. I went back and forth on buying this at first because I really liked the look, but I didn’t love how it made my skin look sallow. The same was true of this brown Banana Republic shirt. I love their make, the feel, the softness of their cotton, but it just wasn’t working. 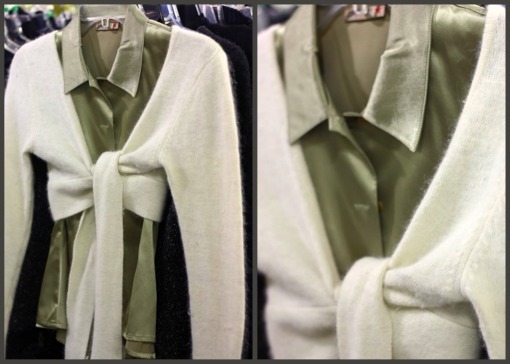 In my “Five Must Do’s when browsing a thrift store for clothes,” I encourage looking for unique details on sleeves and this is a great example of that point. 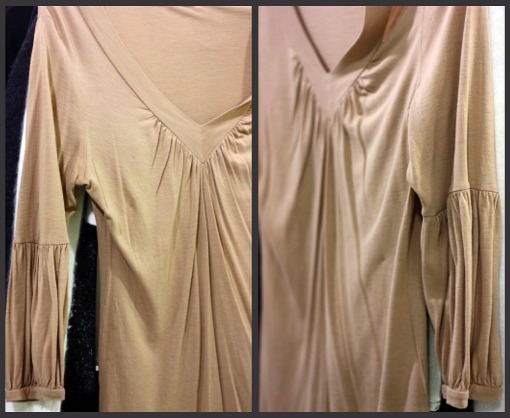 I loved the sleeves, but again, this shade of brown was not for me. I debated accessorizing with a scarf in a brighter shade, which would offset that dilemma, and help the color around my face. I also debated what great chunky jewelry and big hoop earrings I could wear. There were a lot of ways to make this shirt pass, but I just didn’t want the effort of forcing it to work. My “Go To” items for any occasion when I don’t know what to wear are black shirts. I have so many cool black tanks, long sleeves, short sleeves, shawls, wraps…the list goes on, and that is why I passed on these. Even though I don’t have any sheer black shirts like the first picture (can you see it, it’s a black shell under the sheer black shirt and it was SO fun), I used restraint. I knew I just didn’t need either of these, no matter how great they were. You know my love for finding the perfect LBD (Little Black Dress). I am still hyperventilating that I passed this one up, but again, I have quite an assortment. 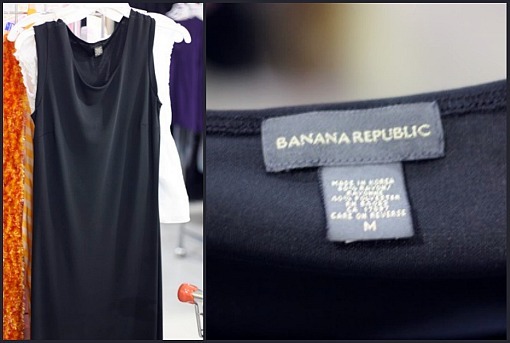 I estimate that this classic, straight, Banana Republic dress retailed for a minimum of $100, and at Goodwill, it was only $5. As I load this picture, this dress is my one regret. For only $5, I should have snagged it. Elegant and simple, this just above the ankle length dress was gorgeous. I should have taken a full picture, but you can see right at the waist, the detail ends and it goes to a straight gray bottom. Typically, I need one fancier dress each year, but I was in the ” I don’t need it” mentality. Hopefully, I don’t regret that decision this summer when I need a dress for weddings, and end up having to pay more at the last minute. Believe it or not, it was a fun shopping day at Goodwill. I got to enjoy finding designer clothes for less, and I didn’t spend a dime. 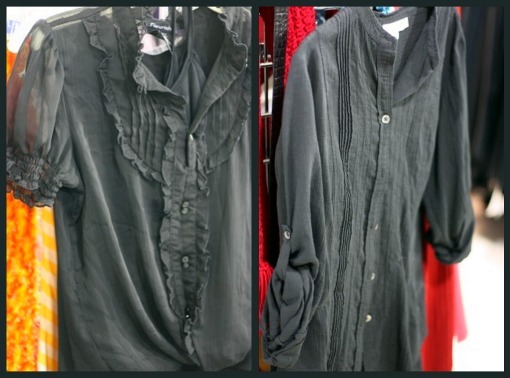 Have you had any fun thrifty finds lately? Wow,am proud of your restraint! That gray dress wud have been in my bag&out the door! It’s classic&classy&wouldn’t be a one-season wonder. I’m seeing it with differnt color wraps&shoes&…oh,my. I would have skipped something on the”real” shopping list, am afraid. But I agree completely on the others,& reasons! I did skincare&color for yrs in addition to everything else because I loved the line -&- having the tools to show people what their best colors were. I was always amazed how many didnt realize a shade or two could either make them glow or look ill! The biggie was getting them to realize it was based on their *natural hair color*&skin tone. Bummer,tho-I haven’t allowed myself the joy of thrifting for a while. Am re-using older items because,gee, they’re “in” again with a couple tweaks! It’s*almost*as good as getting something “new”. Another reason to stay away from “trendy”,stick w well-made, and accessorize. 🙂 That and med chgs do nasties to my size-have to keep a range. 😛 Thanx for great ideas! none of my friends enjoy “treasure hunting” like I do. I just can’t see spending 50 on a shirt when I know if I keep hunting, I will find a great find for $5. But they don’t have to “get” it for me to enjoy it and to know its just plain smart! I also agree that sometimes my “just $5” attitude can add up , so I also have to be careful or keep a list of things I am looking for. My favorite thing is how my three girls come with me and are learning to “treasure hunt” first before buying at the store, they are my thrift store divas! I enjoy your blog so much , thanks! I finally made my way back to Goodwill last week. I was in need of a few new shirts for work. I have a handful of items that I’m able to mix and match to change up my look but they just weren’t working any longer. I found some really nice tops. Some of them I was hesitant about but knew it was either them or going to a store to buy new ones. Since I’m working on losing weight, I figured a $3.79 shirt was better than a $19.99 (or more) shirt even if it’s only worn for a few months. I love seeing all your great outfits and items you find. Unfortunately, our store didn’t have a great selection so I was probably lucky to find the couple items that I did. I found a beautiful black sleeveless dress a few weeks back. It has circles and dots on it and was my size except that the straps were too long (but my mom should be able to fix that). It was also the color of the day. I don’t know brands very well and they don’t matter to me except for the fun of finding out later that I got a really good deal. This dress was Donna Morgan silk/polyester. I’m guessing it’s anywhere from $120 to $140 from what I can tell online and I got it for $3. I also got my daughter a cute dress for $1.25. It was just originally from WalMart but what a deal for a new dress she loves. next time you can just get those and send them MY way 🙂 haha ….my thrifty shop just doesn’t seem to have the deals you find. I’ll keep looking! You found all those in one visit? Wow, I wish our Goodwills were as good. I’ll admit, I would have gone home with everything, so I admire your restraint…. Yep, all those in one visit. Don’t admire my restraint too much. It was a integrity issue..ha. I promised myself I would not buy anything until I went through and got rid of at least one bag. Jen, I’ve been to your Goodwill before when visiting my SIL, and it does have great quality stuff! I too am waiting impatiently for yard sale season to return. I’ll be in a larger city next weekend, and you can bet I’ll be checking out their thrift options! Shannon, I’d love to go thrifting with you! Wow! Thank you for the reminder! Sometimes I just buy something because it’s cute. Then it sits in my closet because it’s just not me! I need to think more when I shop about what is really “me”. I did the same thing yesterday. Went to the thrift store (Rescue Mission here in NY) after taking a break from them for a few weeks and left empty-handed. Was looking for new jeans or shoes for me but nothing was working. Sigh. ..Last week I found a Boden top at my Goodwill. It was $7.99. New, I would not have bought it. But it was lined AND Boden..and looked brand new! And, when I lose weight (ha ha) it will fit even better!! A couple weeks ago, I found a Kate Spade zebra print purse at ..I think it was $6.99. It’s fun finding good labels..but..is that the only reason I’m buying it??? ann – I would have not passed up those deals either. 🙂 Kate Spade..FUN, FUN find! I know you’re in NC, but what zip code (or general area)…I donate lots to our goodwill (foothills WNC), but have never really found anything I liked. It has been a few years though…maybe I should try again. You’re such an inspiration! I’m in the Piedmont Triad area, but I would say definitely give it a try again. Remember, it’s hit or miss sometimes, but that one time you find a score makes it all worth it. Let me just say that I LOVE that you do this series. I get so inspired by your posts Jen! Jen, I failed miserably this week on showing restraint while in Goodwill. I typically go once a week and plan to spend $5 on jeans which I seem to always need (though I don’t find a pair every week) usually it’s hit or miss. This week I ended up spending $16 and as you stated this money could have easily gone toward groceries. I ended up buying 8 new pieces (our Goodwill gets Target overstock) for my 4 girls. Though, the items were really cute, inexpensive, and brand new I can’t honestly say that they needed the items. So I completely understand. Good for you that you passed the test week at least. BTW, I love this series. I really like the dress too. I’m all about finding good deals as well. Thank you for posting about your Goodwill store. I think people sometimes dismiss the Goodwill store for years just because it’s second hand. Some of the stuff still has tags on it! I’ve learned that lesson, too. Sometimes it’s hard not to get caught up in the great deal hype. It’s not a good deal if it just hangs in your closet. Even if I find something that is a great color and style for me, if I don’t have something to wear it with, I won’t buy it — I either have to find something at the GW right then, or it doesn’t go home with me.